Conyers, Ga. – Five Rockdale County Public Schools (RCPS) eighth grade students embarked on a life-changing journey Oct. 10 as the district’s first ever REACH Scholars. Each student will receive a $10,000 scholarship upon completion of the REACH program and high school graduation. The REACH Scholars are: Angela Ruvalcaba, Dyson Lewis, and Shariden Beazer Conyers Middle School; Alayna Crutchfield of Edwards Middle School; Tae’Jon Bailey of Gen. Ray Davis Middle School. Beginning in the eighth grade and through high school, REACH Scholars are paired with a mentor and an academic coach. Scholars must maintain good grades, behavior and attendance. Scholars who successfully complete the program and graduate from high school are awarded a $10,000 scholarship that can be used at any university or college in the University System of Georgia, Technical College System of Georgia, or eligible private postsecondary institution. The scholarship is in addition to any other grant or scholarship the student receives. The students in this first RCPS cohort of REACH Scholars were selected based on grades, behavior, recommendations and rounds of interviews. Each scholar and their parent signed letters of commitment to the five-year program during the ceremony held at Rockdale Career Academy. Rockdale County Board of Education Chairman Jim McBrayer presented a commendation from Gov. Nathan Deal on the launch of the REACH program in RCPS. 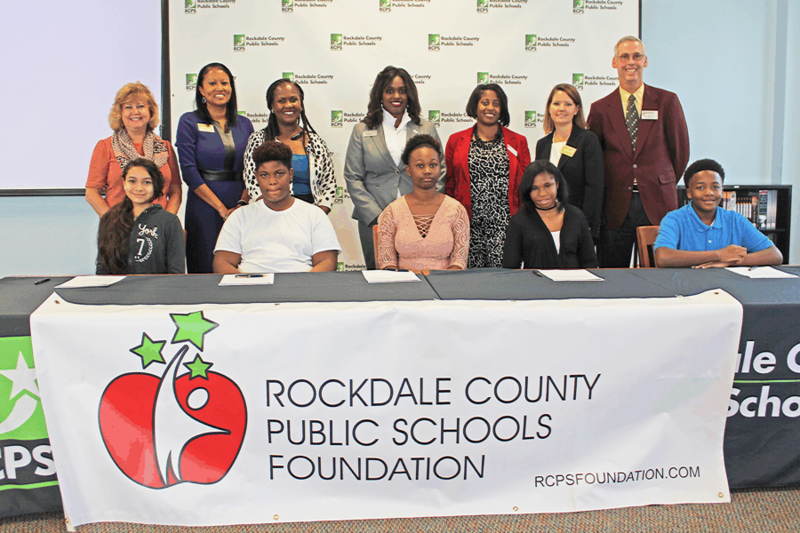 The middle and high school principals, counselors and academic coaches from each student’s current and future schools, along with family members, Rockdale County Board of Education leaders, REACH program leaders, attended the signing ceremony in a show of support. The mission of REACH, which stands for “Realizing Educational Achievement Can Happen,” is to ensure that Georgia’s academically promising students have the academic, social, and financial support needed to graduate from high school and college ready for a successful career. REACH is a key component of Governor Deal’s Complete College Georgia, which identifies strategies for the state’s public and private college.